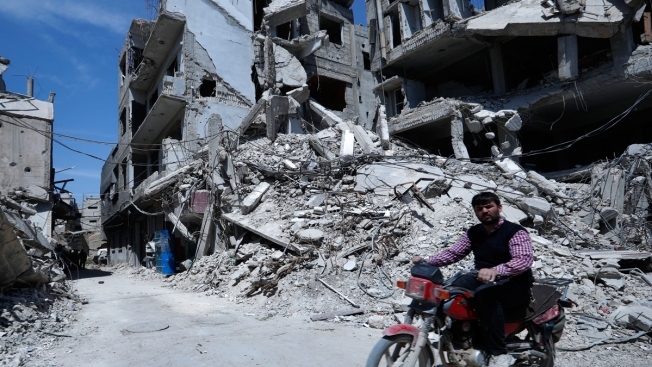 In this April 16, 2018 file photo, a man rides past destruction in the town of Douma, the site of a suspected chemical weapons attack, near Damascus, Syria. The Pentagon said Thursday a "preponderance of the evidence" indicates there were chemical weapons, including "elements" of sarin nerve gas, at the three Syrian sites bombed by the U.S. and its allies last week. Any definitive conclusion probably will remain an open question for some time. Marine Lt. Gen. Kenneth McKenzie said at a Pentagon briefing that the United States believes the Syrian government, six days after the strikes, can still mount "limited attacks" but its ability to conduct research or improve chemical weapons has been degraded. He said its remaining chemical capabilities are "probably spread throughout the country at a variety of sites." McKenzie said if Syrian forces were considering possible future attacks, "they've got to look over their shoulder and be worried that we're looking at them, and we'll have the ability to strike them again." The American assessment underscored the difficulty in getting additional or more conclusive evidence about the Syrians' suspected use of chemical weapons and verifying the allies' success in destroying any large caches of chlorine gas or sarin. "We believe the absolute preponderance of the evidence is that there were chemical weapons" at the targeted sites, including "elements of sarin particularly" at the Barzah research and development center in the Damascus area, said McKenzie, director of the Joint Chiefs of Staff. That was the mostly heavily attacked of the three sites targeted in the missile barrage. He said it was unlikely that the U.S. or allies would gain much access to the sites where the Syrian government reportedly conducted chemical attacks on its own people. The U.S. and France say they have evidence that poison gas was used in Douma, east of the capital, where dozens of people died, and that President Bashar Assad's military was behind it, but the two countries have not made that evidence public. Syria and its ally Russia deny any such attack took place. McKenzie said that plume analysis from the allies' missile strikes and the lack of civilian casualties in the area suggest that no chemical gas escaped into the atmosphere during the strikes that hit their targets early Saturday (Syrian time). The U.S. military has said there was "probably" chlorine and "possibly" sarin at "possibly" all the sites. Pentagon spokeswoman Dana W. White said there are no indications Syria is preparing to use chemical weapons again and there have been no reports of civilian casualties from the allied missile strikes. McKenzie was asked about reports that the Syrians had turned two unexploded cruise missiles over to the Russians. He said he hadn't heard anything about that.